I’m beginning to wonder if the biggest industry in Nigeria and their biggest export is romance fraud. 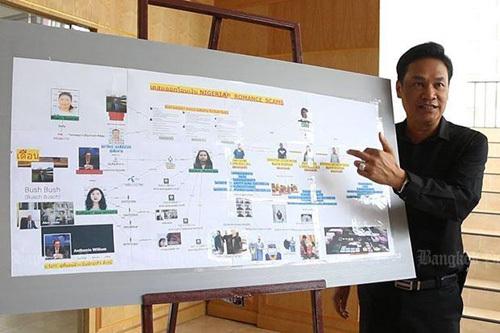 Authorities in Thailand arrested two Nigerian men, along with their Thai wives, for allegedly swindling a Thai woman who owned a rubber plantation out of 500,000 bhat (US$14,038). When the suspects were arrested, police found a list of victims and bank passbooks that revealed more than 50 million bhat (US$1,403,804) had been transferred to their accounts. This is in a country where the average salary is US$385 per month. I love the police diagram of the scam in the photo. I wish police all around the world took romance fraud this seriously. Nigerian love scam busted, on Bankokpost.com. I’m glad this is being done. Their tips not only apply for romance scams coming out of Ghana or Nigeria, but ones that originate from all corners of the world. As you’ve said so many times, if it sounds too good to be true, it probably is! Because Nigerian romance scams have reached epidemic proportions, the Nigerian police have received pressure from other countries to make it stop. That’s why they’re cracking down and demonstrating their efforts. When will your book be out? It’s called, “Combating Romance Scams, Why Lying to Get Laid Is a Crime!” and I’m hoping it’ll be available on Amazon right before Christmas.